Smart Layers is an extremely user-friendly tool. It’s designed to invite your visitors to share your content, show them cool content, and even try to convince them to stay in touch with you on your social networks. But to some of your visitors, Smart Layers may come across a little “stiff.” Just like your parents and grandparents, Smart Layers isn’t always up on the latest slang or teen vernacular. That’s why you can customize! 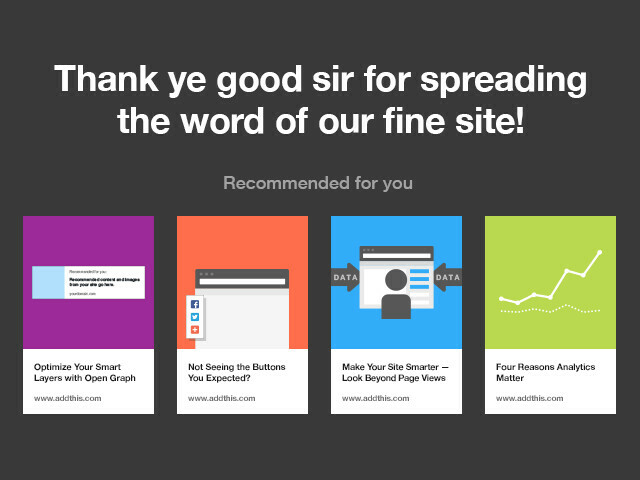 Thank ye good sir for spreading the word of our fine site! Smart Layers provide a number of messages you can customize. For example, you can customize the message shown after a visitor shares, or the message after a visitor follows, and even the messages in the What’s Next Layer. (That includes a share message, follow message, and recommended content message). With all those customizations, you can really make Smart Layers talk the way your audience does. So make Smart Layers one of the cool kids who not only walks the walk, but also talks the talk. Good luck, and if you need help, don’t hesitate to post questions in the comments below or visit our Support Portal.